MIPI D-PHY is becoming an established data interface for cameras and screens in smartphones and tablets. Its high data rate of 1.5 Gbit/s is increasing the importance of signal integrity in assembly design and component selection. 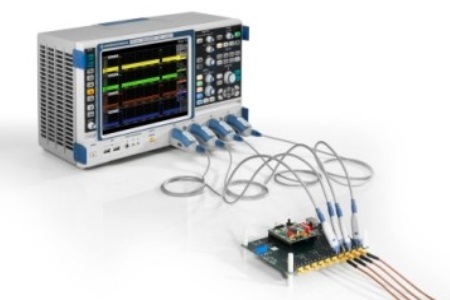 Rohde & Schwarz has expanded the functional range of its R&S RTO high performance oscilloscopes to include automated MIPI D-PHY compliance tests – to ensure seamless interaction between components made by different manufacturers. The new R&S RTO-K26 MIPI D-PHY compliance test software from Rohde & Schwarz offers automated tests in line with the current v1.1 specifications of the MIPI Alliance and the University of New Hampshire InterOperability Laboratory (UNH-IOL). The software is tailored to the needs of developers of smartphones and mobile devices with MIPI D-PHY implementation. The R&S RTO-K26 compliance test software helps users achieve results faster. For example, it takes less than five minutes to measure and assess one of the four terminations specified in the standard (e.g. 100 Ω). The test wizard reduces errors during test setup and execution. Images and step-by-step instructions guide users through all procedures. For individual tests and stability analysis, limits can be adjusted and specific tests repeated. Rohde & Schwarz compliance test solutions deliver especially clear and conclusive reports – from development documents to product quality certificates. For MIPI D-PHY, the software allows users to modify automatically generated test reports. Test results, including a summary of measurement details and traces, can be generated in *.docx, *.pdf or *.html format. The user can run the compliance test software either directly on the R&S RTO or on a LAN connected computer. Precision T&M components are crucial for good compliance test reproducibility. The R&S RTO provides the foundation with its excellent temperature stability and its ability to accurately map and quickly process analog signals. Calibration data is stored in the R&S RT-ZD40 and R&S RT-ZS60 active probes, eliminating time consuming alignment processes and ensuring optimal synchronization at all times. The R&S RTO-K26 MIPI D-PHY compliance test software option for automated MIPI D-PHY interface compliance tests is now available from Rohde & Schwarz.